What president brought us the largest public works program? Franklin Roosevelt gave us the New Deal; Lyndon Johnson gave us the Great Society, and Barack Obama gave us a stimulus package of more than $700 billion. So which president brought us the largest public works program, and how is it doing? The answers to these questions are: 1. Dwight Eisenhower, and 2. It depends on your perspective. In 1956, Eisenhower steered the Interstate Highway System through Congress. In an era of true bi-partisanship, a Republican president worked with a Democratically controlled Congress to initiate a program that eventually cost $425 billion in 2006 dollars. Eisenhower was open to the idea of a massive new highway system because he had crossed the country in 1919 as part of an army convoy, and found that U.S. highways compared poorly to the German Autobahn that he saw following World War II. The plan that Congress passed was an outgrowth of a system that President Franklin Roosevelt had asked the Bureau of Public Roads to research. The final plan authorized by Congress (and only modestly altered after 1956) calls for 65,000 miles of interstate with routes in all 50 states. Eisenhower and leaders of Congress overcame the opposition, because road-building and maintenance had previously been the province of states and localities. They referred to the “commerce clause” of the constitution, specifically Article 1, Section 8, Clause 3 that states that the United States shall “have power to regulate commerce with foreign nations, and among the several States.” The highway system was clearly designed to know no state boundaries; it met the definition of the commerce clause as interstate in nature. In an era when the Cold War was “hot” (the Soviet Union had detonated its first atomic bomb in 1949. and by 1956 there were some who thought that the Soviets had both more powerful bombs and Intercontinental Ballistic Missiles. Bomb shelters (of little use) were being built throughout the U.S., amd children in schools were going through the charade of practicing hiding under their desks in the event of a nuclear attack. Clearly, new ideas were needed to give the American people either a more practical or psychologically relieving sense of security from a nuclear attack. A big selling point of the interstate highway system was that it would provide metropolitan residents with ways to leave their cities and head for parts unknown, where missile strikes were less likely. Lest we be naïve, there were some rather large industries that stood to gain by the proposed interstate highway system, including automobile and truck manufacturers, and producers of petroleum, concrete, steel, and heavy machinery. In addition, organized labor was thrilled to have so many new jobs become available. 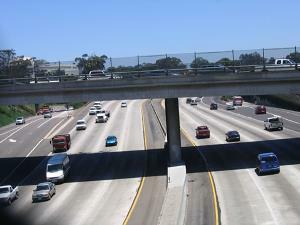 In the fifty-four years since construction on the interstate highway system began, we have not had the scene (except in a few movies) of cars jamming highways to avoid a nuclear attack. However, we have found that the system provides a much improved capacity for people to leave areas of natural disasters such as hurricanes, floods and forest fires. Most of the system’s use comes on a daily basis as people and goods move back and forth across the country. During holidays, people enjoy the system so much that they are willing to spend hours in gridlock, as they inch to and from their destinations. 1. It stimulated an economy that was still reeling from the Depression as well as the reduction in demand following World War II. 1. It was literally the pathway for abandoning our central cities in favor of suburbs. Sprawl became the norm, causing us to use a host of additional resources. 2. It provides tens of thousands of miles for us to use our current choice of transportation, the automobile. 2. It has fueled our addiction to petroleum products and while hybrid automobiles are beginning to make a measurable difference, we continue to rely on a non-renewable and environmentally polluting fuel. 3. It paved natural corridors for economic development including some that are currently key to America’s future such as technology and bio-engineering. 3. Fatalities on the road have greatly increased since the system came into existence. So, as you lament the presence of the interstate system and how the ribbons of concrete have torn cities apart and polluted our environment, remember that it provided a much needed stimulus for the economy. It’s also a big part of why you can order almost anything in the United States today and receive it tomorrow. There is an inescapable irony: As the “Party of No” opposes stimulus packages, unemployment benefits, etc., many of its politicians crow to their constituents about the jobs that they have brought to their communities. When is the last time that you heard a Republican praise Dwight Eisenhower for bringing us the interstate highway system? Don’t hold your breath waiting.